Grilled portobellos are my favorite marinated mushroom recipe. They're easy to make, taste great, and hearty enough to make a full meal. Portobello mushrooms are perfect for this due to their large size and meaty texture. They're often used as a meat substitute, as they're tastier and more interesting than tofu. Use this recipe in place of a meat or veggie burger. Just add a bun, cheese, tomato, onion, or any other favorite ingredient. Alternatively, you could make mushroom skewers. Simply slice into large chunks before marinating, marinate as directed, and then place them on a skewer with pieces of pepper, onion, tofu, meat, or other favorite additions. Now you're ready for summer! 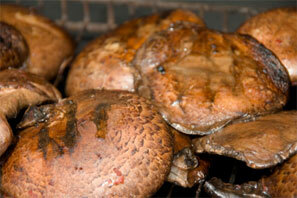 Clean the mushrooms with a damp cloth and remove the stems. You can remove the gills too if you want, although I find that to be too much work! Place the mushrooms in a dish with the gill side facing upwards. In another bowl combine all the other marinade ingredients. Whisk them together so they blend well. Pour the marinade over the mushrooms. Cover and refrigerate for about one hour. You can leave them longer if you want, but with this recipe it's usually not necessary. Preheat the grill to medium. Place the mushrooms gill side up and grill for 5 minutes. Then flip them over, and grill for another 5 minutes. You can cook them a little longer if you want that charred effect! If you don't have a grill, a skillet works fine too. Serve either with greens on a salad, or as a delicious alternative to a normal veggie burger. Add barbecue sauce or salsa to your finished burger. Need some spice? Add a dash of cayenne pepper or a squirt of sriracha sauce. Put a few tbsp of beer in the marinade! After all, what's a cookout without beer? Mix up the marinade ingredients further by adding soy sauce, crushed red pepper, or sesame oil. Add regular burger accoutrements: a few slices of cheese, a piece of tomato, and some greens. Another tangy addition that I love in burgers are banana peppers.